Football Football Football. That is what has pretty much dominated the last few weeks right? World Cup hope and all that. Well especially in my household as Eddy is the biggest football fan ever and will watch any match he can. I think it probably dominates his every day actually as he has a huge passion for the game no ,atter who is playing and was actually pretty good in his time, a few years and two knee operations ago that is. He is still pretty good though when he does play, he has that natural talent and scarily good knowledge that in another life might even have seen him live out his professional footballer dream. He has been lucky enough to play on some amazing pitches though through work and friends (he once split his head open at Chelsea and rang me saying don’t panic but…and then proceeded to send me a photo of him with a bandaged head with red blood all over his white football shirt whilst playing a charity match and all he could do was beam about the fact he got to go down the tunnel and see the interview press area on his way to the hospital (I am sure there is a more technical term for that – of which of course I have no idea about)). It runs in his family, his Dad is a big football fan (I get lost as soon as they start talking all things football, which is often!) And although he has never expressly forced or said anything to the girls about it they of course see his passion clearly and have shared in that with him. Especially Eva. I mean it is hard not to when even as we pass a Sunday league game in the park you better not want to hold a conversation with him as within 30 seconds he knows the ins and outs of each kick. Honestly he is like some kind of football savant. I say Eva though because as much as I can just about muster up enough enthusiasm for England games, and I do love the hope and inclusive camaraderie the World Cup brings, I am also honestly not that bothered. Despite playing a bit as a child I really could take it or leave it these days and at the moment Roma seems to be right there with me. Although at 3 that’s probably only natural. 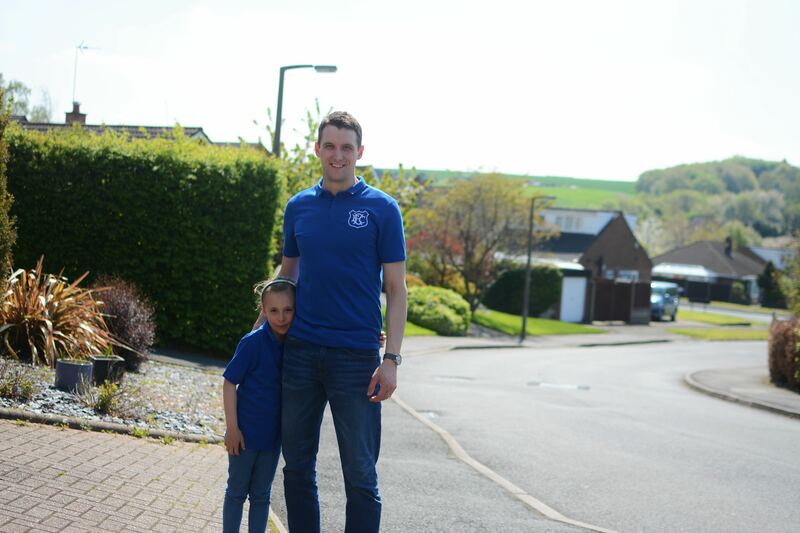 Eva and Eddy have been to some to local games before, I have taken her to see him play, and they have been to many a football related event but then with a sparkle in his eye and a beaming smile on his face a few months ago he suggested taking Eva to her first ever Everton game, at home. 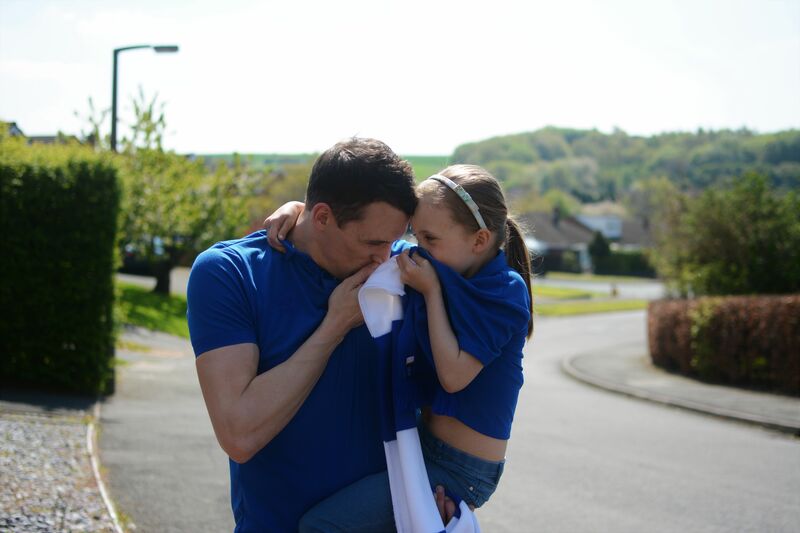 Just as he is the biggest football fan he is also passionately supportive of Everton. 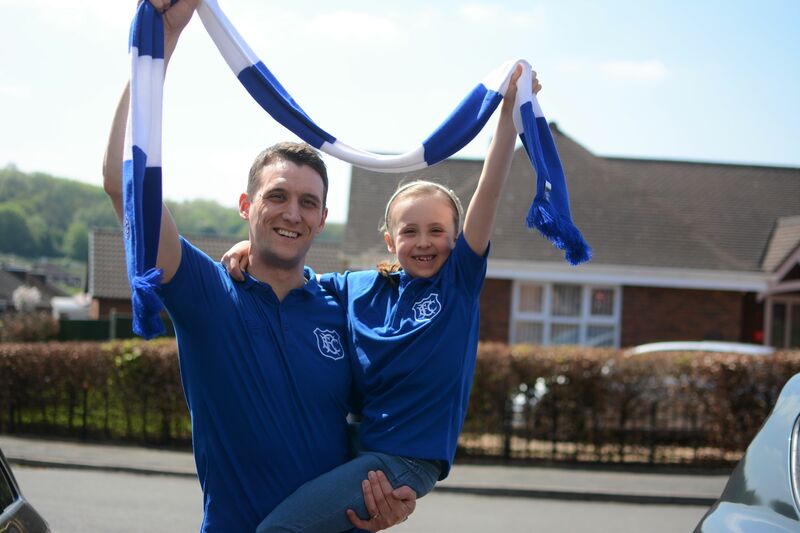 He is just the most loyal fan ever despite living hours away from Liverpool and it was the sweetest thing for them to share in this together, for him to want to take her to his spiritual home Goodison Park. 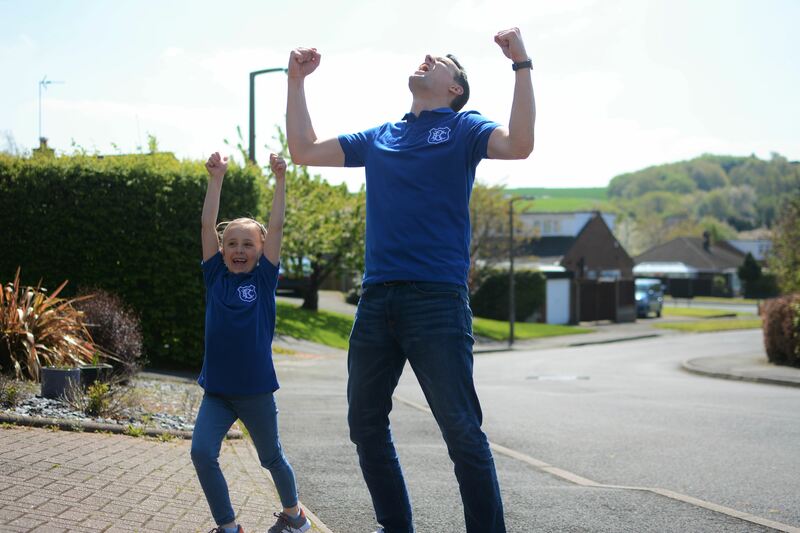 When he told her Eva was so excited, I think mirroring that of her Dad whos face says it all where football is concerned. 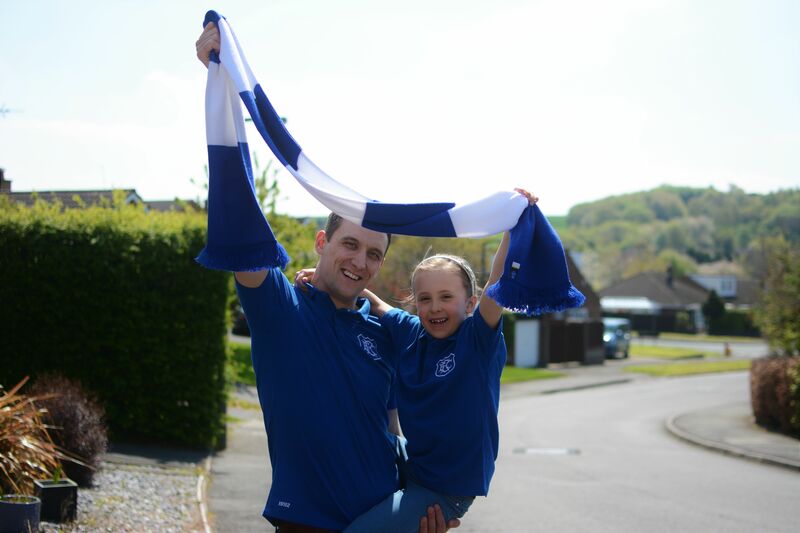 They traveled the two hours there together early so that they could soak up the atmosphere wearing their matching Everton tops, versing the various Everton songs that she now knows off by heart to partake in all of his pre-match rituals and with a smile almost as big as the scarf they hold over their heads. They made a real day of it, they bought a badge, ate chips from the same place, had a photo taken with speedo mick (don’t ask) and even stayed after to meet some of the players, Eddy lived out a boyhood dream meeting Wayne Rooney and getting his shirt signed. He is now making me frame it and put it up in the house too…he loves it that much! He even filmed snippets of his day which is well out of his comfort zone but I can just see and hear how happy and giddy they both are. We tend to spend alot of time as a family, or me and the girls in the week and anything big we share it together. Which of course is nice and I will be honest I get really nervous when the children aren’t with me especially if they are far away and in the car without me, I don’t know why I just like to keep them close. Yet I think I have possibly underestimated how utterly lovely it is to nurture their relationship with their Dad in something they share that has absolutely nothing to do with anyone else. Me included. If and when the time comes and Roma likes it too (it is the attention span she lacks right now, although she does have a good right foot like her Mummy) it will be something they share together and despite never being to a match ever myself I cannot wait for the day I wave the three of them off together. I can already see the pride in Eddys eyes. We might not have won the World Cup this time but to Eddy it will still always be the beautiful game. Aren’t they the cutest!! My husband is like this with martial arts and is so excited for our sons to be old enough to join in too!